1 Only the Professional and Relational Communication concentration is offered at this location. We currently have graduates of our program who hold positions in various communication fields, at big name companies such as the Kelly-Hart Law Firm and Alcon. Students will graduate with the investigative skills and hands-on experience that employers demand. Students will gain real-world experience participating in public relations and event management activities for profit and non-profit organizations throughout Central Texas. Students will have the knowledge to pursue a career in such diverse fields as administration, management, and consulting. The O.A. Grant (Humanities) Building is equipped with Podcast Rooms where students can improve presentations by watching their practice sessions through the top-notch technology provide by the “mediascape”. In addition to the Podcast Rooms, the second and third floors of the building have Media Collaboration rooms, designed for students to meet and work on media related group projects. 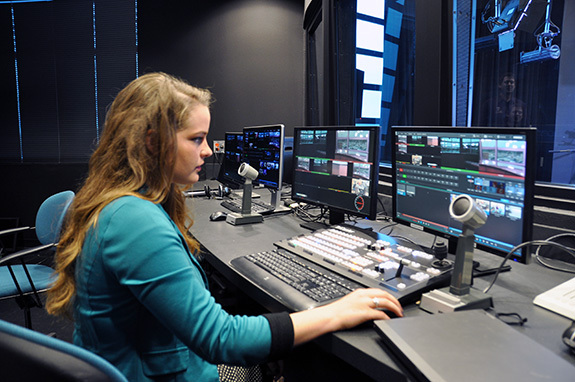 This state-of-the-art facility enables students to gain hands-on experience in both news gathering and broadcasting. In this unique 'learning lab' environment, the Media Convergence Lab allows students to work together in real-world situations to meet daily newscast deadlines, compile and edit news stories, as well as produce both radio and TV broadcasts on a regular basis. This facility is specifically for Public Relations and Event Managment (PREM) majors. From start to finish, events can be put together with careful attention to detail, management of all contingencies, and handled with expert communication plans. From writing press releases to creating budgets to executing perfectly coordinated campaigns for real-world clients, students receive hands-on experience and education.